Bowling machines are considered a luxury in professional cricket across the country. Most bowling machines currently in use for professional cricket are electric ones that cost well over Rs. 1 lakh and can't use real cricket balls. Freebowler is a Bengaluru-based startup that wants to disrupt this market and change how cricket batsmen hone their skills. As you would expect, a lot of the work in hong one's cricket skills is done on practice pitches in the nets. To actually be able to improve, every batsman either needs a skilled bowler to bowl at them or a bowling machine. There is a big difference between a bowler and a bowling machine. A bowler will keep bowling different deliveries, vary the point and pace of delivery, and use a real cricket ball so the batsman can practice. Electric bowling machines, on the other hand, can't be moved around much, and can't use real cricket balls. They use a dimpled polyurethane ball that looks like a slightly large golf ball, which players say doesn't behave like a real cricket ball. It's great at bowling a consistent length so you can work on specific weaknesses, but it isn't ideal to simulate a match situation. Freebowler, which is currently a self-funded company, wants to bridge this gap with its bowling machine. It looks like a metal contraption that belongs on the sets of a medieval fantasy film, but when it bowls, batsmen we spoke to said they found it much harder to face than electric bowling machines. They also said they got to practice with a real cricket ball, which adds a lot to their training. 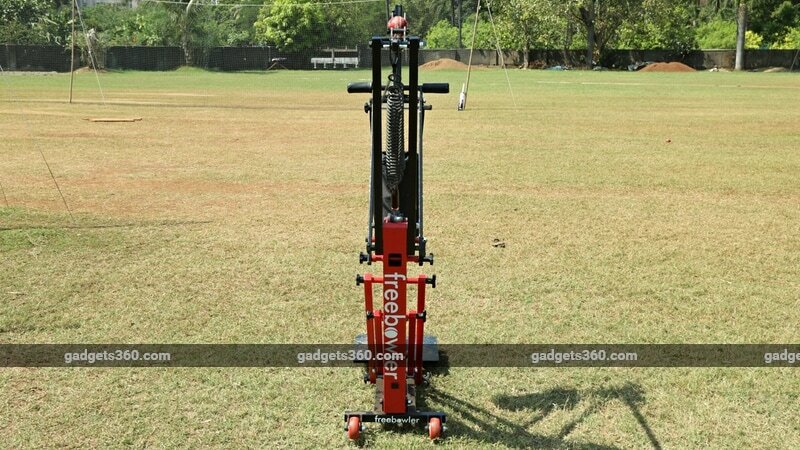 Gadgets 360 had the chance to speak with two professional cricketers who practiced batting against the Freebowler, which is manufactured in Bengaluru, at a ground in Mumbai's Kandivali suburb. Amogh Bhatkal, a 24-year-old an opening batsman for Nirlon Sports Club in Mumbai, echoed his thoughts. “It has a slingy action. It gives more like a bowler experience for a batsman to bat. Sometimes, the machine moved faster and the ball used to come slow,” he said. Prateek Palanethra, the founder, says he came up with the concept in 2016 while he was doing his Master's degree in the US. Since cricket is not very popular in the US, Palanethra says he didn't have any easy way to practice batting. It started as a college project for him as he was trying to keep his batting skills sharp, and he couldn't find any cheap mechanical machine to help him practice batting. This prompted him to start making what is now the Freebowler. Two years on, the first iteration of Palanethra's vision is ready. When assembled and armed for delivery, it's around 1.7m tall. To arm the Freebowler, you have to pull its sling down and lock it in position. Then, you push a metal plate down with your leg to lock it in place. Now you can place a ball on the plastic cup on the sling and signal to the batsman that you are ready to bowl. This signal is very important as the Freebowler's sling moves much faster than any bowler's arm. Then, you pull the trigger and “bowl” the delivery. Palanethra says he showed the machine to officials and players from Cricket Australia and they told him that the rotation of the Freebowler's arm is quicker than the arm rotation of a bowler. “Playing with this improves (a batsman's) reaction time. That's the feedback we got from Cricket Australia,” he said. By now, it is clear that the ability to introduce variations is another of Freebowler's features. You can place the ball with the seam in different positions to simulate different deliveries that bowlers bowl. There's a screw under the plastic cup on the sling, which can be tightened or loosened to adjust the length of the delivery. Similarly, the machine has three hooks, which let you vary the speed between 110 and 130 kmph. 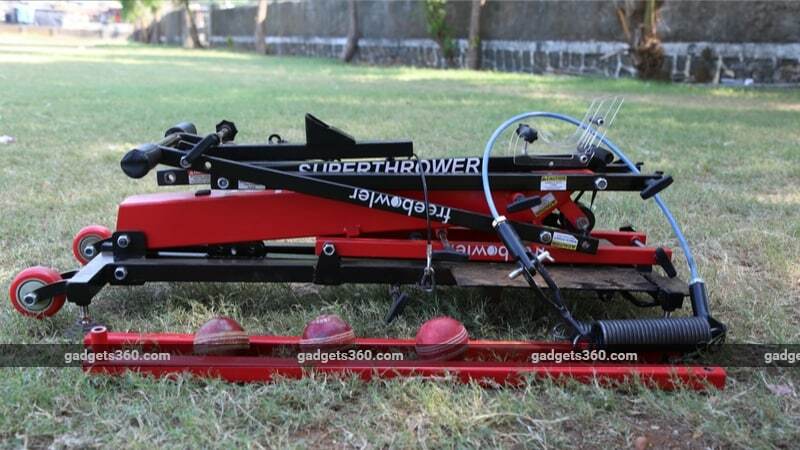 S Nagesh, Chief Advisor at Freebowler, told Gadgets 360 that most electric bowling machines aren't good at bowling a random set of deliveries, which allows batsmen to know in advance which type of a delivery is going to be bowled. However, electric bowling machines are good if the batsman is practicing alone. The Freebowler needs a person to operate the machine, whereas some electric bowling machines allow you to load, say, 10 deliveries and bowl them at the batsman. Having said that, the Freebowler is not without limitations. At the moment the Freebowler can mimic a short, medium pace bowler. The machine is not tall enough to simulate deliveries being bowled by a freakishly tall bowler such as Billy Stanlake. “For professionals, we need to address the height issue. 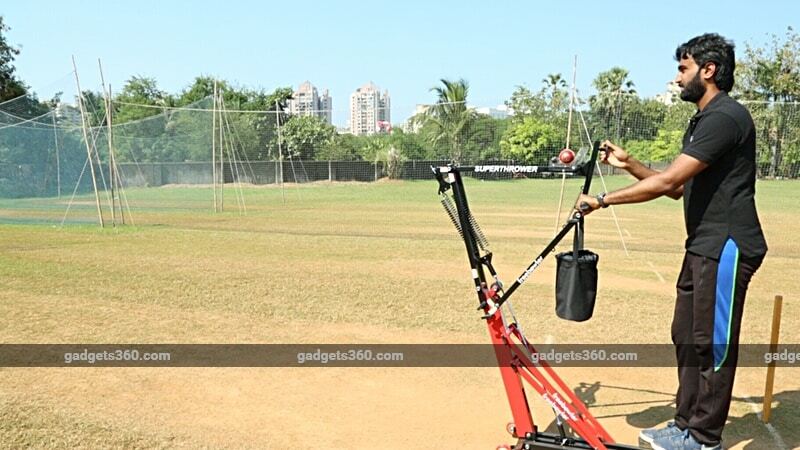 For junior players, up to under-19 this machine is perfectly fine,” Nagesh told Gadgets 360. At the international level, 130kph is not a pace that will trouble any batsman. Freebowler can't hit 140-150kph, which is the speed most international team fast bowlers bowl at. The founder, Prateek Palanethra, said the company has had to walk a fine line between portability and speed. To integrate higher speeds, the Freebowler would need a heavier base, which makes the machine a lot less portable, he explained. Finally, Freebowler is not a spinner yet. If you want to practice against spin, the machine won't be of much use right now. “We have tried a few prototypes but it is still at least six-eight months away. We wanted to get this product out first,” Palanethra said. He added that the company is also working on figuring out how to integrate a camera and some kind of sensors to give batsmen basic data such as how many deliveries they faced and how they played certain shots, etc. He adds that these components are built to last for 10,000 to 30,000 cycles depending on use. The act of arming the machine and bowling a delivery is one cycle. Palanethra told Gadgets 360 that with heavy use (four hours a day of nonstop use) these two components will last around two months. With normal use (two hours a day for up to five days a week), they'll last for six months or more. You get all of this in a package that weighs around 27-30kg, and fits in a bag that's about the size of a standard cricket kit. The Freebowler is priced at Rs. 40,000, which is far lower than what most electric bowling machines cost. Freebowler is currently in discussions with multiple cricket academies across India and has around 100 pre-orders so far. The company also has a presence in international markets such as Australia and the US, and for now, its focus is on establishing a footprint in cricket academies across India.